There are many different species of cricket. Each species undergoes the same three key life cycle stages: egg, nymph and adult. The time needed to complete each stage varies slightly according to species. Crickets go through incomplete metamorphosis, meaning they do not enter into a pupal stage, but hatch from the egg looking like adult crickets. 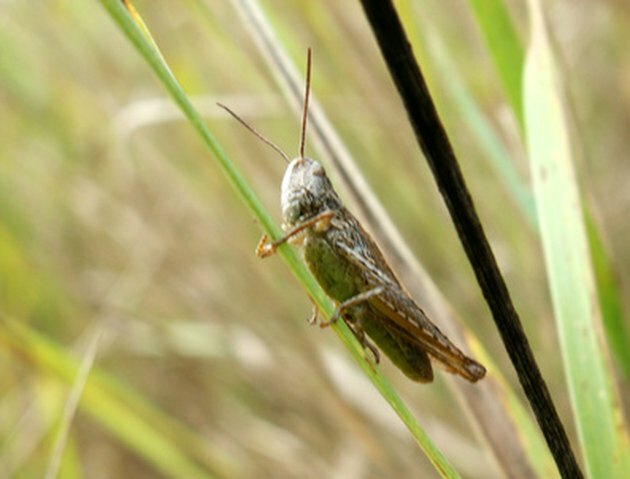 Crickets go through three major life stages. Male crickets "call" to female crickets during the mating season by scraping their wings against one another. This is what creates the familiar cricket chirp. Males chirp in order to let the females know where they are located. Male crickets also chirp in order to establish their territory. Female crickets generally lay eggs in the late spring or early summer. The female cricket deposits between 50 and 100 eggs into the soil, usually about half an inch deep. In some species of cricket, eggs are laid on plants. The female cricket uses a special organ known as an "ovipositor" to deposit the eggs into the ground or plant. The eggs hatch in about 14 days. Nymph crickets are very small when they first emerge from their eggs, measuring only about 1/8 inch in length. Cricket nymphs commonly become pray for larger crickets. Though the cricket nymphs appear like adult crickets in many ways, they are not as developed. The female nymphs do not have an ovipositor for egg-laying, and neither the male nor the female nymph have a developed set of wings. Like those of several other insect species, the stages of growth that the nymph cricket undergoes are referred to as "instars." Crickets usually go through eight to 10 instars before reaching adulthood, which takes about two to three months. Crickets start to develop wings at about 1 month of age. Adult crickets usually measure about 1 inch in length. Adult crickets have bodies with three distinct segments: the head, the thorax and the abdomen. They also have three pairs of legs and two antennae. In most species of cricket, the adults have wings. Adult crickets are usually omnivores, eating insects and plant matter. Crickets usually live for about two months.